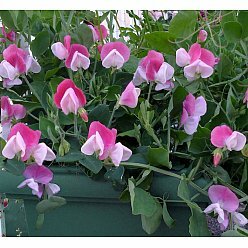 Bushy dwarf form ideal for containers and borders. Rose-pink and white, fragrant flowers smother the plants - you'll just love it! Can withstand heat and drought well. Best sown in small groups. 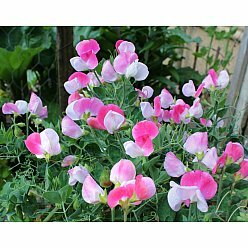 Look also for our Sweet Pea Cupid and Easy Peasy Pea seed mix - plant both together for a continuous display of both flowers and fresh peas.